Accessories - Fake Stones, Decoys, Books, Foggers Need an education on water garden construction or pond plants? We have a full line of books to choose from. 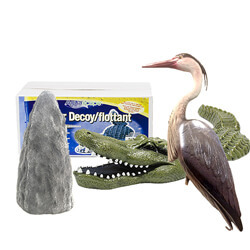 Need a fake stone or blue heron decoy? You'll find it here. How about a decorative floating duckling or alligator? We have those as well! Decorative cover faux stones for use in covering skimmers, waterfall filters, well caps, and outlets. Deters herons from coming to your pond by tricking them into thinking another heron is already there with a decoy. We have decorative floating alligators and ducklings as well. Get inspired! These books explain design principles and construction hints for ponds, waterfalls, and accessories as plants and fish. Creates a soothing, natural layer of fogging mist above water surface. Available units are suitable for small and large water features. A book every prospective and current pond owner should have on their bookshelf. How to Build Ponds and Waterfalls and Much More... was written with the consumer in mind - a show and tell presentation of everything needed to build spectacular water gardens. These step-by-step methods are shown in an easy to read format and have been taught to thousands of do-it-yourselfers.